The term “Switch rod” seems to be very popular in debate with countless attributes to where its true invention came from. I am not going to attempt to explain the history of the switch rod or tell you how to use it, what I am going to do is explain how I use the switch rod and hopefully you can learn from my trial and error from using these rods. For me the switch rod has to have the ability of single hand casting overhead and then double-handed casting with a spey cast. In my eyes that’s the beauty of the rod, its versatility. 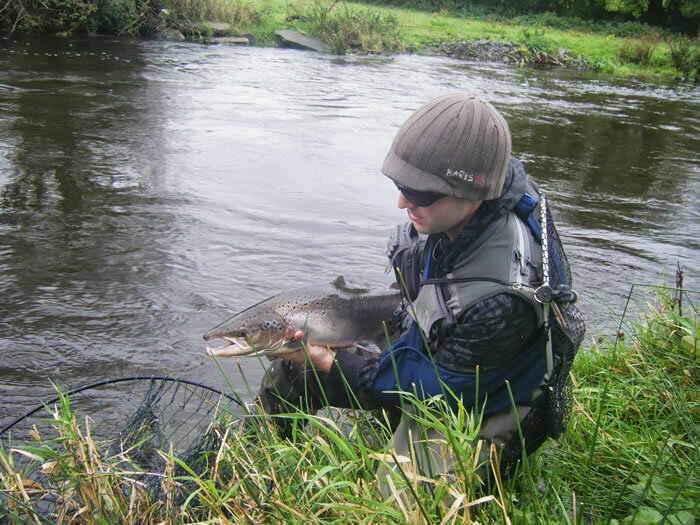 I live in Ireland and salmon fishing is my passion, I mainly use switch rods in their pursuit. There are a variety of rivers of varying lengths, widths and terrain for me to fish but I use my switch rod for the small to medium rivers where I know I can cover the river effectively. The rod I use is an 11ft Guideline Lpxe Switch rod rated #7/8. This for me is the perfect switch rod, the bottom handle is easily concealed for overhead casting and the rod is light enough in the hand to be used as a single-handed rod. It has a medium/fast action and has a forgiving temperament that can be tapped into easily. You may say, but that’s a 7/8 rod? How could you tame fresh Atlantic salmon with it? Well I have done it and it is no problem I can tell you, even double figure fish can be tamed. 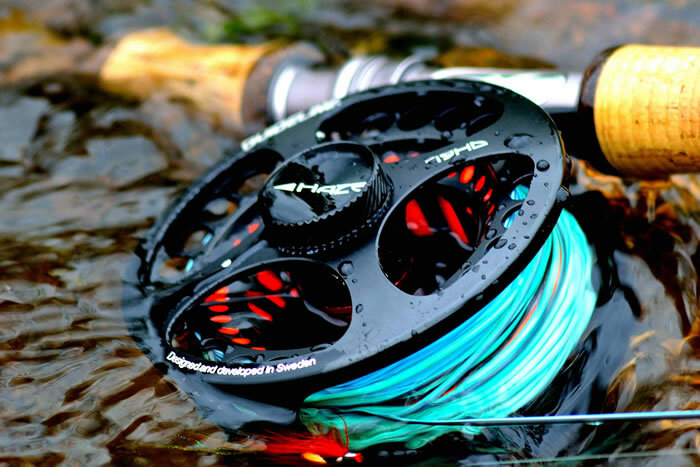 Do not be afraid to use your reel to fight salmon. If you hold the rod high and bend it into fish this will put a certain amount of pressure on the fish but too much of it is transferred to the rod, point the rod lower and use the reel. Bully the fish with the drag, the rod will take the pressure of the sudden headshakes of the fish. If you have a good leader and knots you should not be worried about a breakage. It can be a bit scary when you start doing this at first but you will be able to handle fish and catch and release them quicker if you choose to. Sure the hook might slip sometimes but that’s salmon fishing, as we all know! I team the Lpxe with a Guideline Haze HD 7/9 reel. The Haze HD was designed for switch rods and it suits them perfectly. The Haze is very light and perfect for a lightweight setup like a switch rod. It has great capacity for backing/ running line and fly line and a strong drag and large arbor make it a great candidate for taming Atlantic Salmon. I put a TSL 0.28 running line on the Haze which is 25lbs breaking strain, more than enough for me! The TSL is light and thin and really helps when shooting line with a spey cast. I leave the running line on the reel permanently and I interchange lines by connecting directly to it. Not just my shooting heads but my WF lines and integrated heavier Switch lines. This way I use one rod, one reel but the only difference in reference to where and what I want to fish for is the line. I make my WF lines around 22 metres long and cut off the excess running line. They are around twice the length of a shooting head and not too difficult to store and attach. So I have a loop at the running line end of my WF lines and just connect it up to my TSL running line on the reel through a loop to loop connection. You may think it a pain and slow to run a WF line through a loop to connect it up but just think, how many fishing hours do you have per day? Five to ten minutes rigging up the line that you will use for that day is not a lot to give! The line is shorter than the normal length of a WF line and makes it that bit easier to store and change. Even if a fish does strip you or if you make a mammoth cast you will just be eating into the TSL running line. The TSL has a lovely small loop so the connection is minimal. This way I can carry a multitude of lines from shooting heads to WF’s and if needs be adapt to given scenarios or situations where I may want to change tactics. But why would I want to do that? For me the big advantage of the switch rod is in its adaptability and versatility. When I arrive to a river I look at its geography, access, banks, trees, and clearance. I sum it up and say to myself how am I going to effectively put the fly where I want to? For me I want an option of three lines for my switch rod. A light and subtle WF line #5/6, a switch line within the rods AFTM rating and a shooting head and running line combination with a suitable gram rating for the rod. Let me explain the three uses I have for each line. 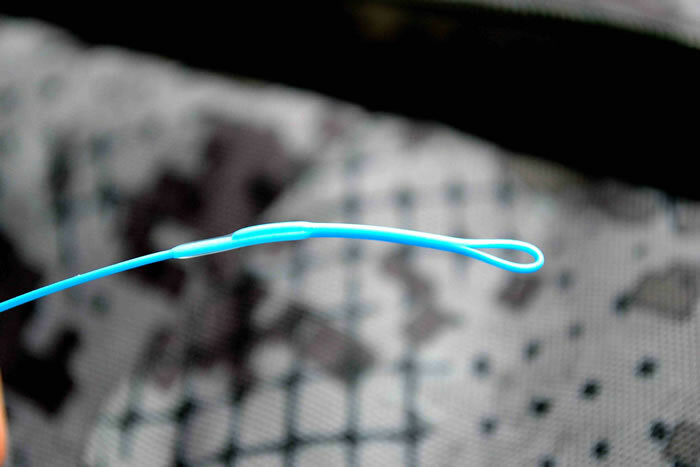 So firstly my Lpxe switch rod can be used as a single-handed rod with a light WF line. A river on its bones has very different challenges to overcome but with a light line and stealthy approach it can offer the best fun with superb visual fishing. I want small flies and a light leader so I will chose a lighter line like a #5 or #6 WF which I will use overhead as spey casts with this line lose their effectiveness as they are too light to load the rod effectively. There is a trade off with a lighter line but in low water conditions a WF has distinct advantages. I am usually able to wade further in the river and stay clear from the riverbank and trees so I can safely overhead cast and really present the fly positively towards my intended target. I find turnover and presentation with a WF line can give an edge over a spey cast which will cause slight disturbance on the setup and if all goes wrong can slap on the water. A stealthy delicate approach is the name of the game here. 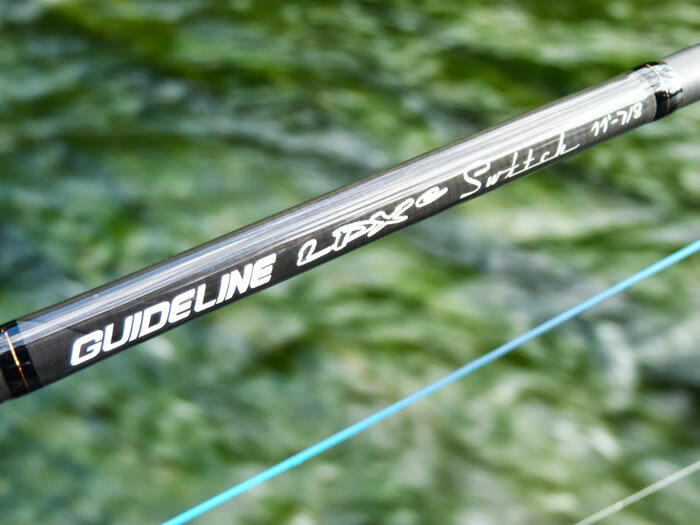 Two lines which I like are the Guideline Experience and Bullet, they are two fantastic WF lines for a switch rod but both with different characteristics. The Experience line has a long belly and gradual taper which gives fantastic line control and a really subtle presentation. It excels in open water but is equally as effective with a short line in tight situations. Read more here.. The Bullet is a short head line which requires little effort to shoot and fish with and is perfect for restricted casting situations and minimal false casts. The line navigates the approach towards how to fish, the switch rod is the tool that remains constant. So at the other end of the spectrum I could arrive on a river that is high and swollen or has a low temperature. The casting distance, fly size and sink rate of the line have now completely changed and I need a different approach to get my fly where I want it. Again I assess the river and decide on my line choice. I will use a Guideline compact shooting head with my TSL running line, the 21gram Single hand #7/8 head goes perfectly on my 7/8 Lpxe. The compact heads are easily brought to the surface for the setup of a spey cast and the triple density gets the fly fishing quickly at the desired level and maintains great contact and feel with the fly as it swims through a pool. The light heads cast superbly and because of their short length and given a typical 11ft switch rod they can be used in some very tight situations. I also use a DDC 21 gram shooting head which is cut from a double hand #8/9 DDC head. The DDC is a sink tip shooting head and this gives me superb versatility with a great range of tips from a float to a sink 6/7. I find this head works great on open water where I can really release my cast and use more overhang increasing the line length. Read more about customizing your Power Taper here..
And then lastly I am never without a switch line. The Guideline switch has a taper like a shooting head but the line is integrated with no connection from head to running line. This line also has a 15ft multi tip, a float sink 3 and sink 6. I use a #8 or #9 depending on where I am fishing. This is a slightly heavier setup than my shooting head one but perfect for small rivers where the complete head may not be outside the rod tip. This way it is easier to get a load on the rod in difficult situations or when casting short distances with only a small amount of line in the air. This is the line I use on my local rivers which are small and I team the Switch line with 8/9 DDC tips (#8 switch) or 9/10(#9 switch) DDC tips as I like the dual density sink rate, they work really well with the Switch line as they are the same weight and length as the original tips that come with the GL switch. There are a wide variety of lines that will suit your switch rod but each has a trade off. The switch line tries to do the job of a WF and a Spey line and it does that to a certain degree but not to the same potential as a dedicated WF or shooting head would do. The AFTM rating for me is a rough guide and I use the gram or grain rating of the rod to give me an idea of the suitable lines for it. 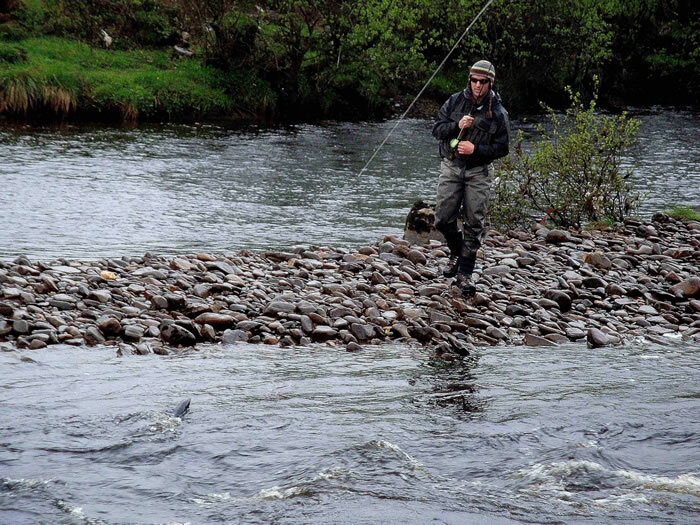 To sum it all up I think that three lines on a switch rod can give you a fantastic arsenal for your salmon fishing. A light WF line for the subtle stuff, a switch line within the rods AFTM rating and then a shooting head running line combo for spey casting, distance and sink lines. 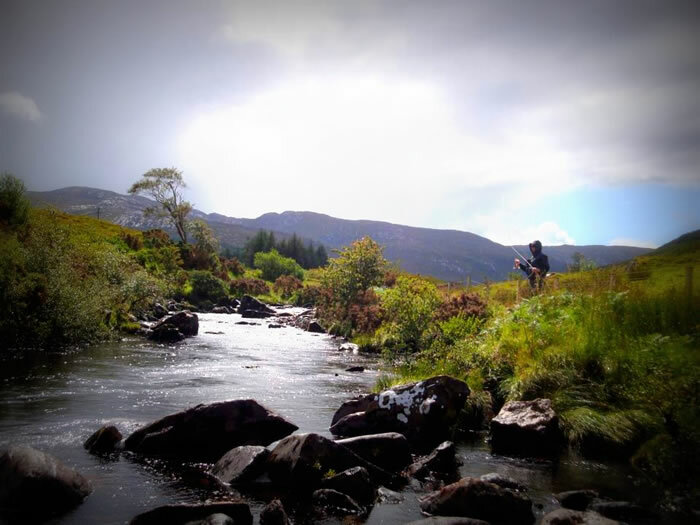 You need to look at the rivers you fish, the flies you use and the approach you want to take, then you can decide what lines suit your rivers and your fishing! With that you have a rod that can be used over a vast spectrum of fishing situations. You and your switch rod will become inseparable and there will be a clear favourite among your rod tube collection, I promise you! Check out Liam’s Blog Switchboy! Previous Take your kid salmon fishing! Coosing the leader for salmon fishing must be decided after the line and depth you want to fish on. On fast sinking lines and deep fishing there is no need for a long leader, 60/70cm with level 0,43 will do. On float/sink lines many prefer longer leaders like this: 1m 0.55 1 m 0.43 – 1m 0,36. But you can also use a polyleader for salmon, they come in a lot of densities and just add a tip to it. I’m not sure whether this post is written by him as no one else know such detailed about my problem. buyed a lpxE switch 11″ 7/8 in the spring last year.. any touth on what line i shoud buy for it? weight and length?